Maple Leafs Syndrome afflicts Senators fans? The Ottawa Senators are now 8 games into a losing streak, fans are moaning and calls to fire either the general manager or coach go unheeded by the owner. 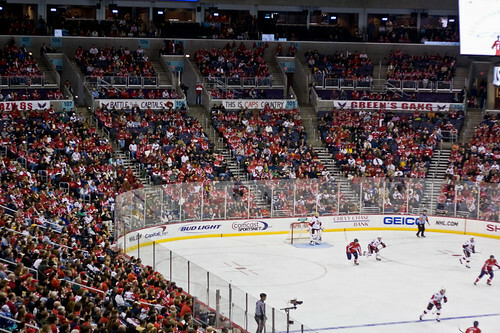 So, one might assume, lousy hockey and annoyed fans should result in falling attendance, right? Nope. 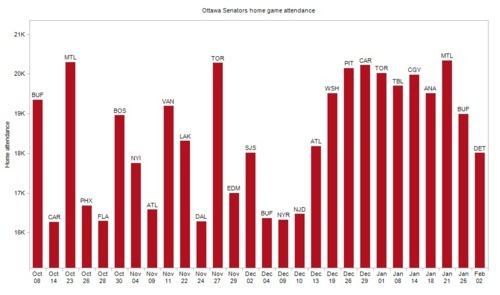 Just as the Toronto Maple Leafs sell out every game despite chronic on-ice, futility, Senators supporters are expressing their discontent by… buying tickets. In social science terms, there is a negative correlation between the team’s winning percentage and the attendance at home games. My crunch of the data shows it’s a pretty strong correlation, too — about .72, where 0 means no correlation at all, and 1 is a perfect correlation. The worse the team does, the more fans come out. UPDATE: I’ve heard a lot of suggestions on why this might be the case. One of our sports guys at the Citizen dismissed this as old news, saying the team always knows that sales are better in the second half of the season. I ran this theory through the numbers for this season and the previous five and it holds up, although not to the extent that would explain the current trend. On average, attendance is strongest in March, at an average of 19,798 and weakest in October, at 19,178. As the above chart shows, the trough to peak difference in the current season rolling attendance average is about 1,677 — nearly three times the difference in the change seen over past season. Also, some Twitter posts suggested this was a criticism — that I disapprove of fans turning out to support a bad team. I’m neutral on that point but it’s worth noting Ottawa sports fans have long been accused fair-weatherism. These data suggest just the opposite. Another theory advanced, based on lots of anecdotal info, is that the corporations that buy season tickets to entertain clients start giving them away to employees when the team loses. These “real fans” are more likely to show up at the game, boosting attendance (but not sales) even if the team struggles.